The Princes in the Tower is a hotly debated topic in the world of English/Plantagenet/Tudor historians. I’ll let you decide their fate for yourselves. Edward IV was a King of the House of York, crowned in 1461, deposed by the House of Lancaster in 1470, then restored in 1471 and ruled til his death in 1483. He had two sons that lived through infancy, Edward, Prince of Wales and Richard of Shrewsbury, Duke of York. King Edward also had a younger brother, also named Richard. In April of 1483, Edward IV suddenly died at age 40. The 12 year old younger Edward was now King Edward V and informed of his fathers death at Ludlow Castle in Wales. His father’s brother, Richard, was appointed Lord Protector of the young Edward until his majority. Richard met up with his nephew on the way to London, dismissed his entourage and took the young King to the Tower of London to await his coronation, as was the custom at the time. His coronation was scheduled for late June. Edward spent all of May, and part of June alone in the Royal Residences of the Tower. His younger brother Richard joined him in mid June. Richard was about 10 years old. On the 16th of June, evidence was presented before Parliament that Edward had been precontracted to marry another woman, before he married the mother of his children. Precontracts were binding at the time, so these allegations meant Edward IV was a bigamist. And being that he and the woman he was supposedly contracted to were both dead, no one could refute the claim. By an act of Parliament called Titulus Regius, Edward’s children were illegitimate and the uncle of the young Princes, Richard was now King of England. He was crowned on June 26th 1483. Around this time, the boys were seen playing outside within the Tower grounds. They would be seen a couple times, through the bars of the windows, but by the end of the summer, they were not seen again. Richard III never spoke of them, but during Henry VII’s reign, a man named James Tyrell was arrested for supporting another claimant to the throne, and confessed to the murders of the boys at the request of Richard III. However, this was confessed under torture so it is unreliable. But it still became the official story during the Tudor regime. There are a few people who could have killed or had the boys killed. Sadly we’ll never know. Two sets of bones were found during renovations to the Tower in 1647. 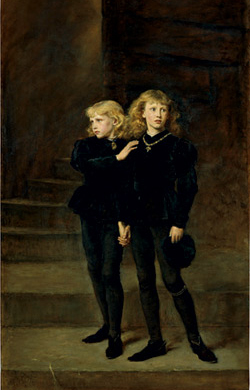 They were believed to be of two children, namely, the Princes. The bones were interred in Westminster Abbey in a royal tomb. In 1933, the tomb was opened and the the bones examined. They were determined to be of two children, who were related and about the ages of the boys. Modern science could possibly identify them, but there has been no official inquest to open the tomb again. Some believe that Richard III had the boys killed, as he had the most to gain, but there other suspects namely, Henry VII, Henry’s mother, Margaret Beaufort, or the Duke of Buckingham, as he had a claim to the throne himself. This is unfortunately one mystery that will never be solved. May the boys have found the peace that alluded them in life.